You have many choices in touring companies when you come to Dubrovnik and its surrounding areas so what makes our tour company so special? Tour the Game of Thrones in Dubrovnik specializes in private tours that contain information on the Game of Thrones television franchise and Dubrovnik and Croatian history. Unlike many other tour providers, we are customizable so that we can fit your needs. Other touring companies only run group tours. You don’t know who you are touring with and you certainly have no wiggle room to customize your trip. We are always happy to comply with the clients’ requests and more than ready to customize the tour to match their preferences. At Tour the Game of Thrones we often have special requests for tours that involve families with small children, people with limited mobility and yes, even tours that involve pets, mainly dogs. We are ready to accommodate everyone! Recently we had the privilege of hosting the American-German couple Kat and Matt who brought their dog, Justin, along for a ride on tour. Justin, a cross between a German Shepard and Labrador, was a fun guy to tour with. At 3 years old, he was very happy and playful, however, he had a minor incident when he veered off the tour path through the bushes and scratched his paw. Some sorcery was involved and we quickly fixed him up. He was as good as new, just like Jon Snow after his resurrection in Season 6. 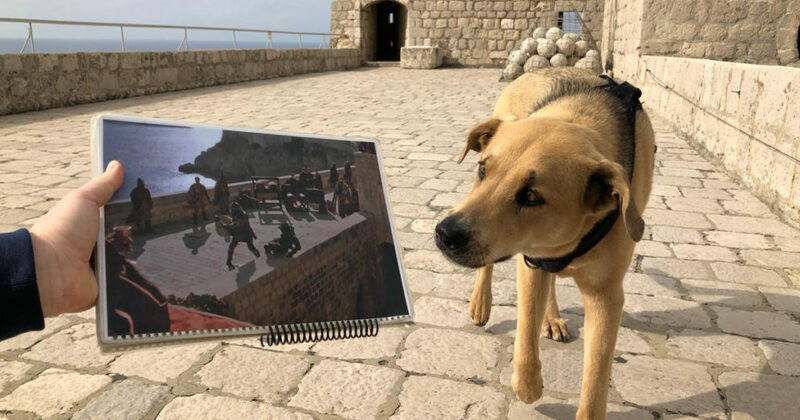 Justin, who is a great fan of the Hound, covered all the filming points in the Old Town of Dubrovnik and its surrounding areas from the Blackwater Bay and the Red Keep to the cobbled streets of the Flea Bottom. Kat and Matt re-enacted a few scenes from the show, as can be seen in the images, but Justin wasn’t as impressed. He was more into making new friends with the local cats after his resurrection but sadly, the cats didn’t share his interest. This particular tour ended with Justin claiming his rightful place on the Iron Throne. He seems to have fully understood the burden of responsibility that comes with ruling the Seven Kingdoms, as can be seen from his expression. We think he is perfect to be king! Tour the Game of Thrones is an all-accommodating tour company that will take you to all of the major filming scenes from the Game of Thrones while teaching you about Croatian history in the process. Croatia is a country steeping in amazing history and we think everyone should learn about it. We are unique in that we offer private tours to accommodate your group size and interests. If there is something in particular that you would like to see, we can arrange it for your tour. Tour the Game of Thrones with us and bring along your pampered pooch. We are so customizable that even a dog will love it!